Gajwel: Chief Minister K Chandrashekhar Rao on Wednesday asserted that Andhra Pradesh Chief Minister N Chandrababu Naidu’s claim that there was hardly any water left in the Krishna and that people of the two Telugu States must share Godavari water was nothing but a conspiracy in the making. “Naidu is conspiring to control Telangana’s affairs through his proxies in Telangana Congress,” he said. “At the Kodad public meeting today, Chandrababu Naidu presented his proposal and made the Congress leaders, including Rahul Gandhi, endorse his proposal. It is evident that he is conspiring to deny Telangana its rightful share in Krishna water by misleading the people, and the Telangana Congress leaders, who are accustomed to slavery, nodded their heads in approval,” the Chief Minister said in his last election rally here before campaigning came to an end in the State. Calling Naidu’s bluff, Chandrashekhar Rao recalled the several attempts made by the TDP president to sabotage creation of Telangana State and later, obstruct its growth through various means, including writing letters to the Centre objecting to the irrigation projects taken up in Telangana State. He highlighted the dangers of putting the State in the hands of Prajakutami, which could lead to a return of the pre-bifurcation era of atrocities and suppression of the people of Telangana by Andhra rulers. Chief Minister and TRS supremo K Chandrashekhar Rao at his last election rally in Gajwel on Wednesday. “If KCR wins, Telangana will get Kaleshwaram project. But if Congress-TDP Prajakutami wins, it will be the end of Telangana,” he declared. He said by June next, the Kaleshwaram project will be completed and all irrigation tanks will be filled in the first phase to bring one crore acres under cultivation. He stated that his efforts for Bangaru Telangana had begun to bear fruit and a fruit-bearing State like Telangana must not be handed over to the devils of yore. Launching a scathing attack against the Congress and TDP leaders, Chandrashekhar Rao said leaders of the two parties were frustrated. “While Congress leaders are frustrated over losing power in the State, Naidu is frustrated over losing control over the State. He wants his proxy government in the State to control the affairs here,” he said. He pointed out that Naidu deployed his Andhra leaders, AP intelligence sleuths, crores of rupees and other resources from Andhra Pradesh to influence voters in the State, and urged people not to fall for Naidu’s tricks and tactics. The TRS president recalled that Naidu took away seven mandals in the State along with the Sileru power plant, besides denying Telangana’s share in power through cancellation of power purchase agreements. “Naidu tried to play a double game by denying power to Telangana and then made his partymen raise slogans demanding a stop to power cuts. Despite all his (Naidu’s) efforts, the State achieved uninterrupted power supply to all sectors and it is the only State to supply free and uninterrupted power to the farm sector,” he added. 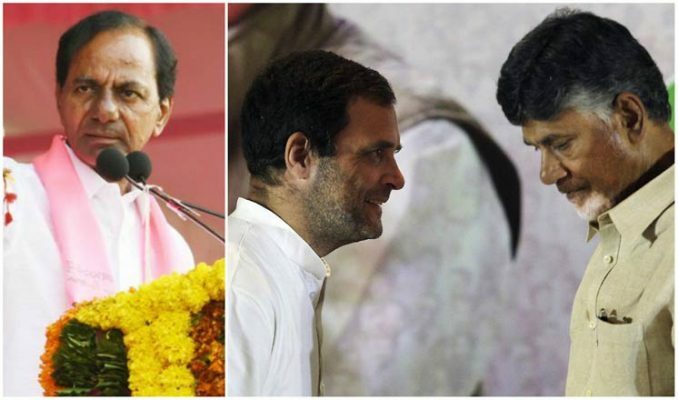 Describing Congress leaders as power-mongers who could stoop to any level, Chandrashekhar Rao held the Congress responsible for the forcible merger of the erstwhile Hyderabad State with Andhra Pradesh. He recalled that no leader from Telangana Congress had dared to object when the then Chief Minister of undivided Andhra Pradesh N Kiran Kumar Reddy refused to release funds for Telangana region. “Even today, no Congress leader has the guts to question Naidu when he said there was no water in Krishna river. Should we, the people of Telangana, also accept and endorse the lies of Naidu?”, he asked the people who shouted a resounding ‘no’ in unison. Chandrashekhar Rao said the TDP president was attempting to mislead people through his election gimmicks and political strategies. “But people need not get confused with false and fake surveys being publicised and get worried over the fate of the State. I have toured all 119 constituencies in the State and declare that TRS will win more than 100 seats for sure,” he said. He pointed out that there was a belief that the party that wins Gajwel constituency will come to power in the State and he was confident of winning the seat with a huge margin. Recalling his struggle to put the State on the development path, especially with regard to power supply and construction of irrigation projects, he said that due to the efforts of the TRS government, Telangana became the fastest growing State recording a growth rate of 17.17 per cent in State-owned tax revenues which translates into an additional income of Rs 12,000-Rs 16,000 crore to the State. “We made several achievements and I also understand that we need to plug a few shortcomings which will be addressed in my next term,” he promised. Chandrashekhar Rao said his efforts were to ensure that each farmer in the State will have a bank balance of Rs 5 lakh. Apart from resolving the pending issues pertaining to purification of land records and issuing land pattas in the next term, he said free power to farm sector as well as Rythu Bandhu and Rythu Bhima schemes will be implemented as long as TRS remains in power. He also reminded people that the TRS government had increased the godown storage capacity from four lakh tonnes to 25 lakh tonnes in the State in less than four years. He vowed to stand in support of all traditional occupations for their revival and also strengthen rural economy. Explaining his future plans, the Chief Minister stated that his welfare schemes were rooted in the day-to-day life of people, and not imported from Russia or the US. He recalled that Kanti Velugu programme was conceived from his experiences in Gajwel constituency after an eye camp that was conducted at Yerravelli village. Similarly, teams of ENT and dental doctors as well as diagnostics teams will visit every household in the State to prepare health profile of all citizens. Besides extending all the government schemes, Chandrashekhar Rao also promised to ensure that no family is left without a double-bedroom house in his home constituency of Gajwel in the next four-five years. He also promised to provide two cattle per each household to increase milk production, besides establishing a new dairy if required. He promised to fulfil each promise made in the TRS election manifesto as well as those which were not made. TRS secretary general K Keshava Rao, Irrigation Minister T Harish Rao and several other leaders of the TRS party attended the meeting.